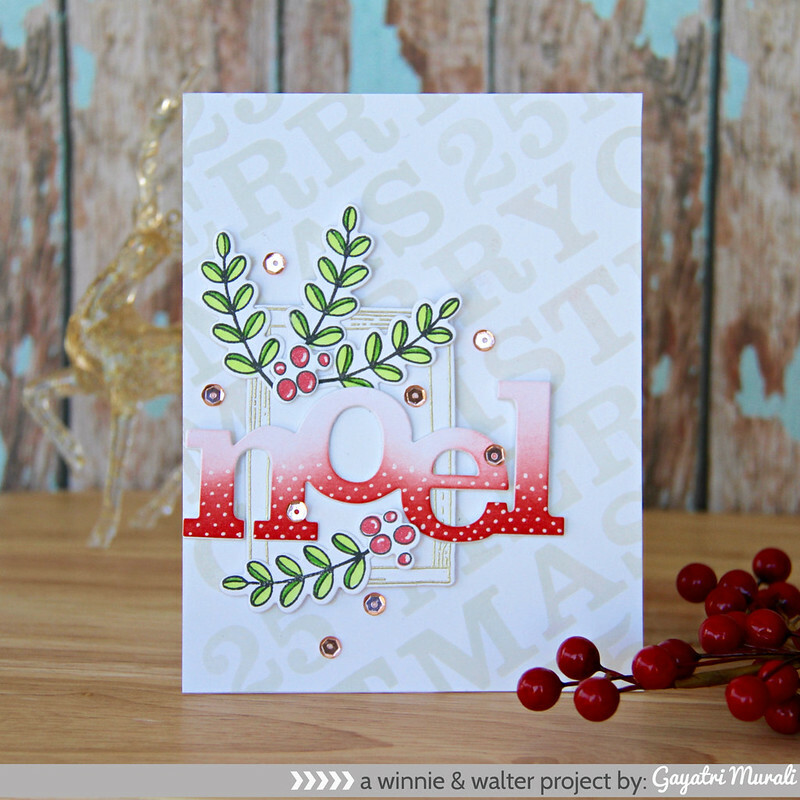 Winnie & Walter – A Set of Noel Cards! 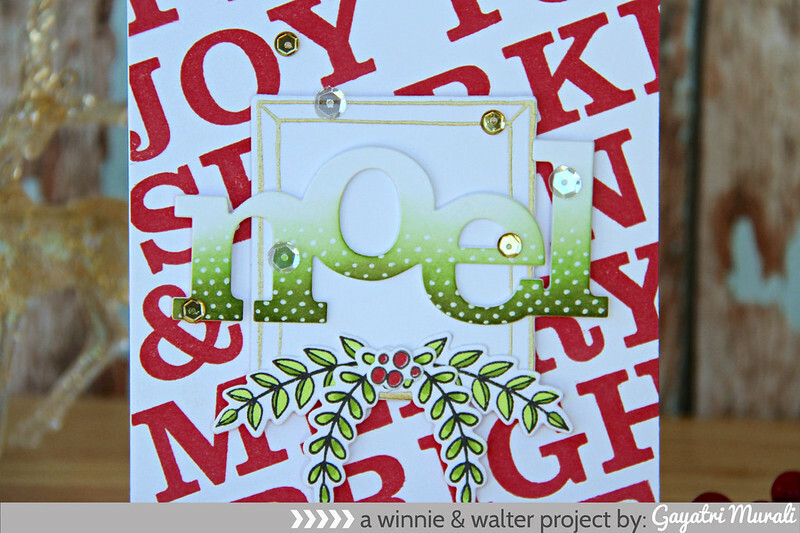 I have a set two Christmas cards to share with your using Winnie & Walter’s new release stamp set and cutaways. 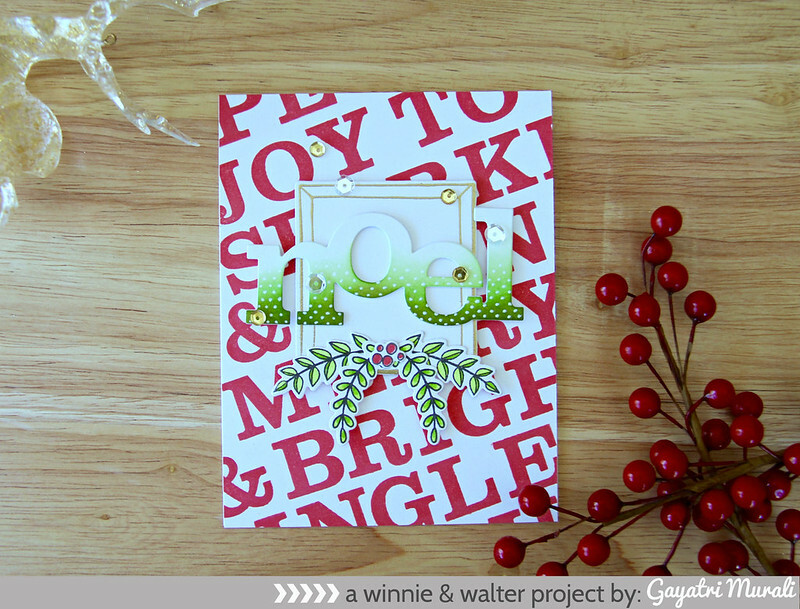 I am also at Winnie & Walter Blog today. 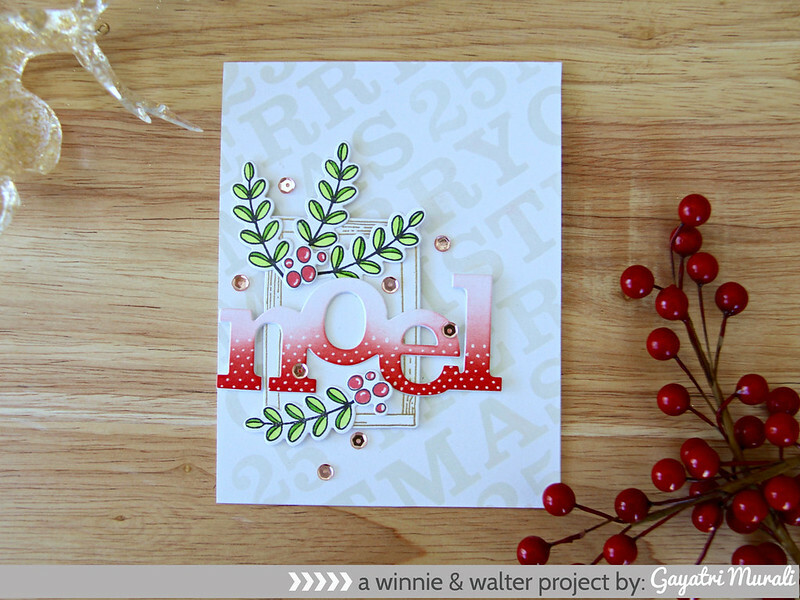 I have used Framed with Evelin T Designs stamp set, Typecast: Cary stamp set, Framed with Evelin T Design Cutaway and In a Word: Noel Cutaway. Both of my cards are similar yet different. They are similar in layout, the elements used but different in colours and the placement of the elements. Here is my first card. 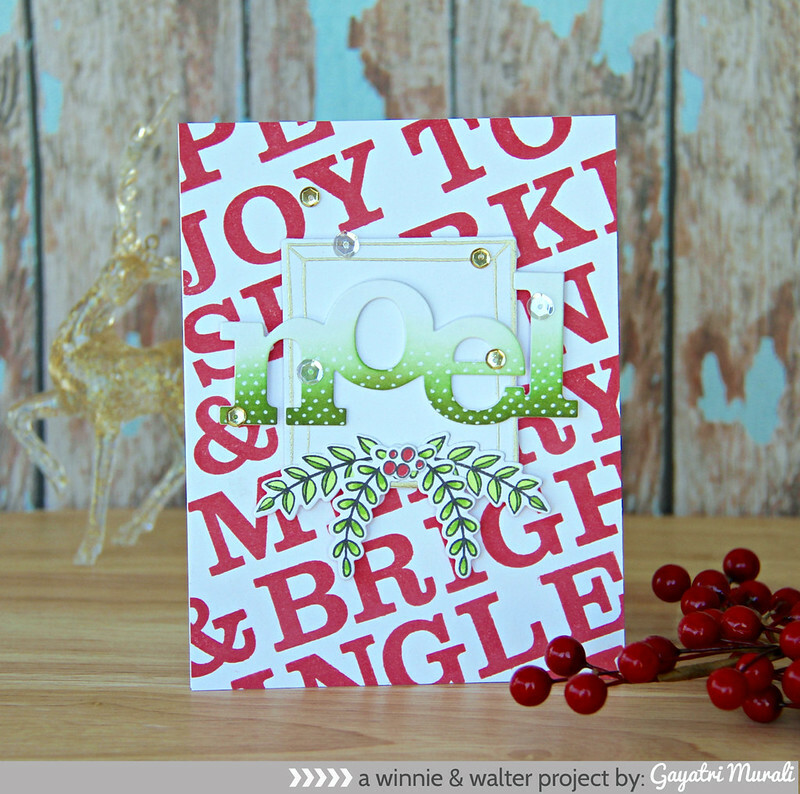 I used the alphabets and numbers from Typecast: Cary stamp set and stamped the sentiment saying 25th Merry Christmas using light grey ink on the card front at an angle. I did draw lines to keep the spacing even. I erased the pencil lines after stamping the images. Since the background is neutral, I wanted my focal elements to pop out of the neutral background. For the focal point I gold heat embossed the frame from Framed with Evelin T Design stamp set and die cut the frame out using the coordinating cutaway. I also stamped the leaves and berries from the stamp set, copic coloured and die cut using the coordinating cutaway. Then I also die cut In a Word: Noel cutaway using white cardstock, sponged Candied Apple distress ink in ombre and added details using white gelly roll pen. I adhered the frame offset on the lower right of the card front using foam adhesives, the NOEL flush on the frame and foam on the edges to the cardstock. Then adhered the leaves and berries to frame the sentiment. Finally embellished with rose gold sequins. Now for the second card, I did the background similar to the first one using Typecast: Cary stamp set. But I used red ink and a variety of christmas sentiment to create the background. I again drew pencil lines diagonally to get the spacing right and once stamped the background, I erased the pencil lines. For the focal point, I used another frame from the Framed Evelin T Design which I gold heat embossed. Similar to the first card, I also stamped, copic coloured and die cut the leaves and berries from the stamp set using coordinating cutaway. 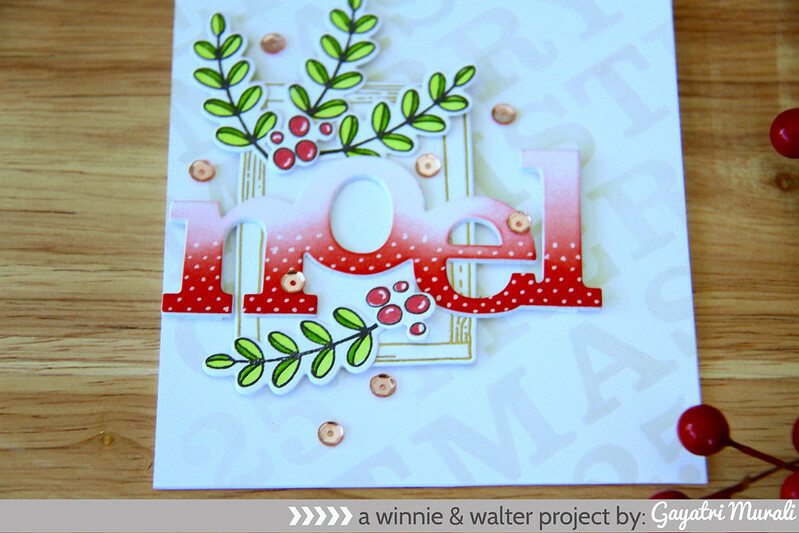 The sentiment Noel is die cut using white cardstock, sponged Mowed Lawn distress inks in ombre and added details using white gelly roll pen. On this card, I clustered the elements on the top centre of the card front. The frame using the foam adhesives, the sentiment NOEL flush glued on the frame and foam on the hanging edges and the leaves falling from the frame with the berries in the centre. I used sparkly clear and gold sequins to embellished the card. You can change colours while the alphabets are arranged on MISTI to stamp a few card fronts. And also emboss a few more frames and elements to mass produce the design. Just vary the placement of the focal cluster and you get a variety of Christmas card. 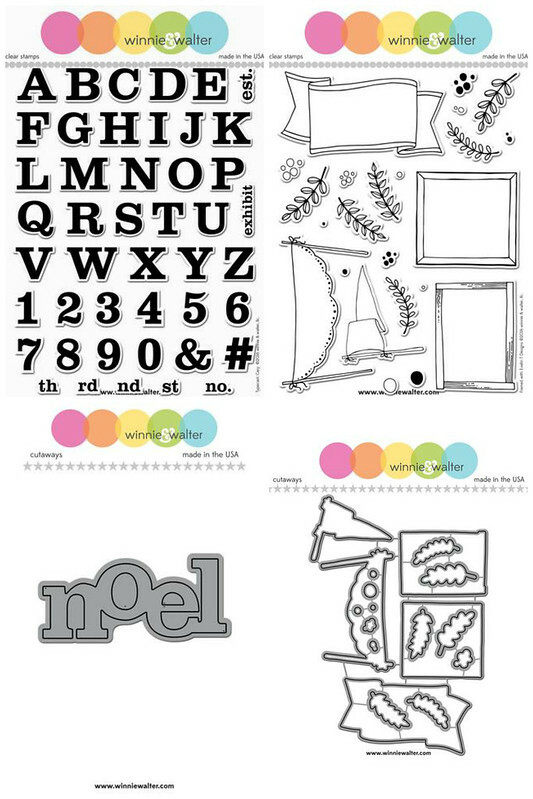 I absolutely love the Typecast: Cary stamp set. Bold alphabets and numbers. It is a must have stamp set in my collection. The Framed stamp set is gorgeous to add layers and love the hand drawn images. Of course, the In a Word cutaways are fabulous. Big, bold and great focal point word dies. This release by Winnie & Walter is fabulous. Hope you are inspired by my cards. Thanks for stopping by. absolutley beautiful cards Gayatri – the graduated colour on the “noels” is lovely!